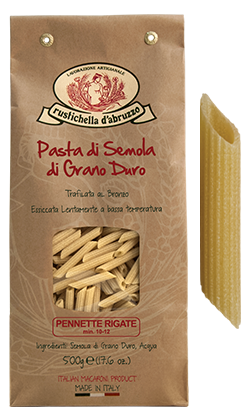 With a smaller diameter than Penne and a superior length, this type of short pasta is very well served with condiments of vegetables but also with a simple Rustichella d'Abruzzo “Pomodoro e Basilico” sauce. Cooking time: 8-10 minutes. 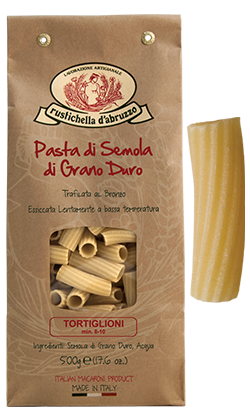 One of the most well-known and worldwide sold types of short pasta, they are traditionally combined with Rustichella d'Abruzzo “Arrabbiata” or "Amatriciana" sauce or with a fresh and light condiment made with tuna, mozzarella and cherry tomatoes. Cooking time: 10-12 minutes. 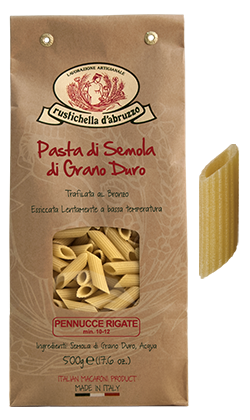 With a smaller diameter than Penne Rigate and a superior length, this short pasta shape combines very well with zucchini and shrimp, vegetables and with Rustichella d'Abruzzo "Arrabbiata" or "Puttanesca" sauce. Cooking time: 10-12 minutes. 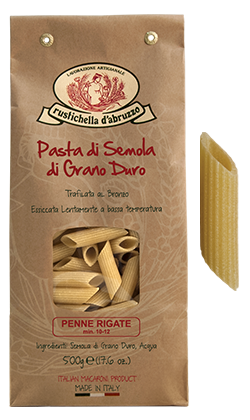 With a smaller diameter than Penne, this particular short pasta is known to be the most widely used shape in the realization of a first course with seasoning "vodka and bacon" or with "Pachino" cherry tomatoes and basil, or with Rustichella d'Abruzzo "all'Ortolana" or "Peperoni" sauce. Cooking time: 10-12 minutes. With a length significantly lower than Penne Rigate, this short pasta is known to be the most widely used shape in the realization of a first course with seasoning "alla Amalfitana" (tuna, tomatoes, mozzarella and black olives). It matches the Rustichella d'Abruzzo "alle Olive", "all’Ortolana" and "Amatriciana" sauces. Cooking time: 10-12 minutes. One of the most well-known and worldwide sold shapes of short pasta, it is traditionally combined with Rustichella d'Abruzzo "Arrabbiata", "Amatriciana" or "Norma" sauces or with a fresh and light condiment made with tuna, mozzarella and tomatoes or with scampi and zucchini. Cooking time: 10-12 minutes. 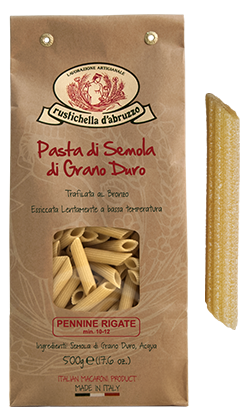 Originally from the Campania region, this type of pasta in short version was born as "long". It matches condiments like veal ragù sauce or meatball and crunchy vegetables sauce, following the ancient Neapolitan tradition, and is ideal with Rustichella d'Abruzzo "Bolognese" and "alle Olive" sauces. Cooking time: 10-12 minutes. Originally from Southern Italy, this type of pasta was made in ancient times by skilled pasta makers, twirling rapidly Spaghetti around an iron rod. 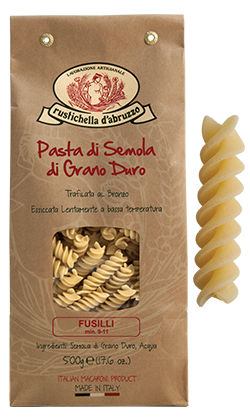 Today, Fusilli represents one of the most famous shapes of pasta in the world. 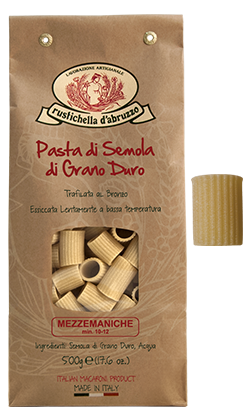 Recommended with Rustichella d'Abruzzo "alla Salsiccia" or "Genovese" sauces. Cooking time: 9-11 minutes. Cylinder-shaped, this short pasta is widely used especially during summertime, combined with seafood-based sauces or with scampi and courgettes. It combines very well also with several sauces like Rustichella d'Abruzzo "Bolognese", "alla Salsiccia", "alle Olive" and "Pomodoro e Basilico”. Cooking time: 10-12 minutes. 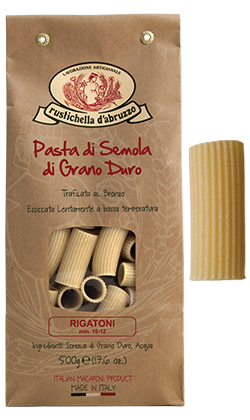 Rigatoni with reduced size, it is used especially with seafood-based condiments for fresh and light meals, or with broccoli and sausage. It matches Rustichella d’Abruzzo "Bolognese" and "alla Salsiccia" sauces. Cooking time: 10-12 minutes. This type of short pasta, which has spiral grooves on the surface, is often combined with vegetable-based condiments or is used to make the "pasta alla Carbonara" with crispy bacon and pecorino cheese, in alternative to Spaghetti. 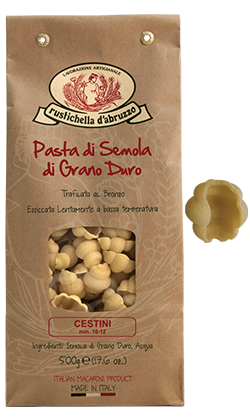 It also combines very well with Rustichella d'Abruzzo "alla Salsiccia" white sauce and "ai funghi Porcini" white ragù. Cooking time: 10-12 minutes. This shape of short pasta , which has longitudinal grooves, is among the most requested ones for making first courses with seafood-based condiments, with prawns and courgettes, with mushrooms and truffles, or stuffed. It can also be used for making baked pasta, to be seasoned, for example, with eggplant and mozzarella. Cooking time: 10-12 minutes. Type of Fusilli in a "double S" shape, with a characteristic central groove, originally from Sicily, but also known in other regions of Southern Italy. 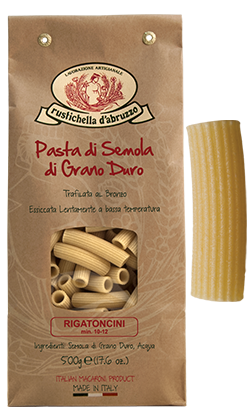 It combines well with Rustichella d'Abruzzo meat sauce and condiments with vegetables or seafood. Cooking time: 9-11 minutes. 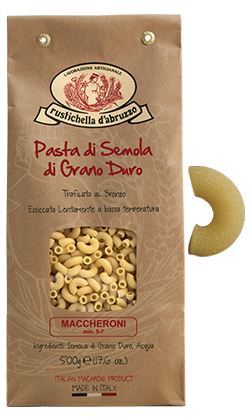 Short pasta originally from Sicily, rough, porous and half-moon-shaped, it is ideal with the Rustichella d’Abruzzo "alla Norma" or "Peperoni" sauces. Cooking time: 8-10 minutes. Curious, original, “shell-shaped” pasta, this type is particularly suitable for collecting the sauce in its interior. Perfect both with vegetables for a cold summer dish and with a sauce with olives or Rustichella d'Abruzzo "alla Norma" sauce. Cooking time: 10-12 minutes. 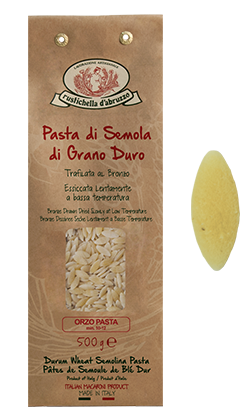 Particular type of pasta similar to barley grains but with larger size (between 1.15 and 1.30 mm), perfect for the preparation of vegetable soups or simply as pastina in a soup. 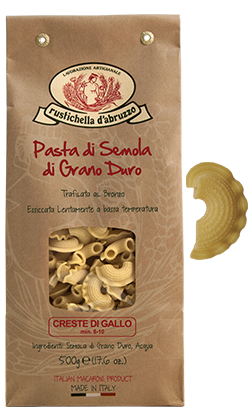 Also recommended for cold pasta salad with cherry tomatoes, mozzarella, basil and with Rustichella d'Abruzzo porcini-aromatized extra virgin olive oil, or simply as a "healthy" starter with Rustichella d'Abruzzo “Intosso” extra virgin olive oil. Cooking time: 7-8 minutes. Half-cylinder-shaped, this short pasta is ideal mainly in legume-based soups, vegetable soups, or the traditional recipe "Cacio e Uova". It also matches Rustichella d’Abruzzo "pesto alla Genovese" or "crema ai Carciofi" sauces with the addition of almonds. Cooking time: 10-12 minutes. C-shaped short pasta, it is used mainly with vegetable-based condiments and fresh ricotta cheese or a simple tomato sauce with basil. 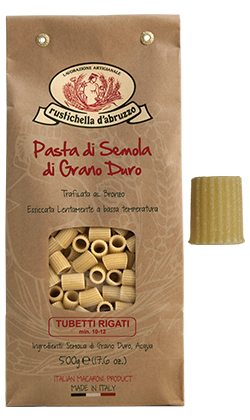 Ideal with Rustichella d'Abruzzo "Ortolana" and "alle Olive" sauces. Cooking time: 5-7 minutes.